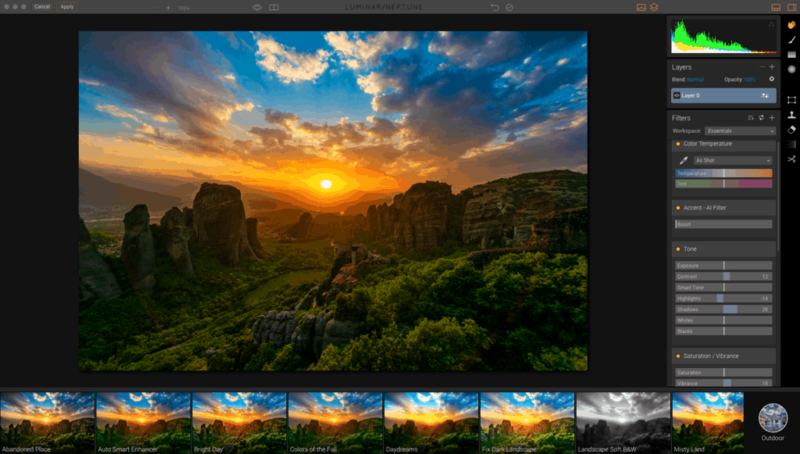 This is a Skylum Luminar review and it does not disappoint. The price of the software is extremely inexpensive for what it can do. And guess what? You can try it out for FREE. You can grave your copy here. If you choose to buy it use code FINEART at check out to get a discount when you follow this link. What is Luminar? 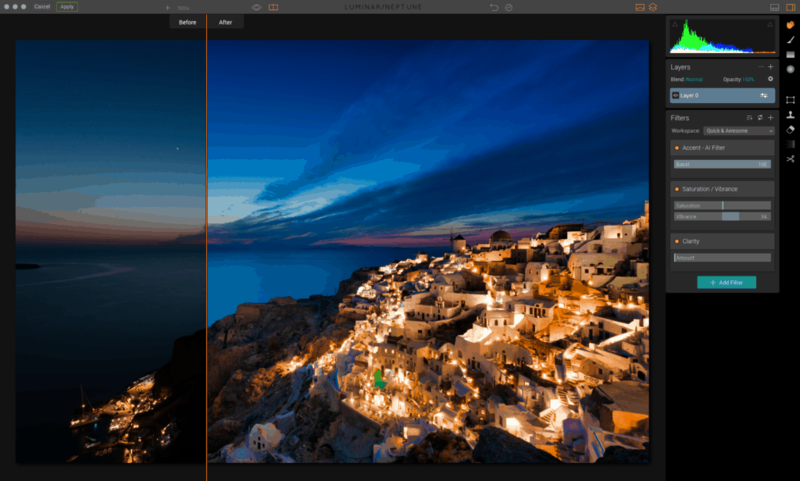 Luminar is the new editing software made by Skylum. It is incredibly fast and the possibilities are endless. I have been using it for a while now and it is really good. While trying to find something broken in the software or something missing I keep finding new features. I can not find anything wrong with the software as of this Luminar review. When you open up the software, right off the bat the first thing you see is a set of presets at the bottom of the screen. This is really good because it gives you a good idea of what the photo can actually look like before you even start doing anything to it. If you really like what you see, then you can just use that preset and be done with it. I know it is that awesome and super simple to do. Who is Luminar For? 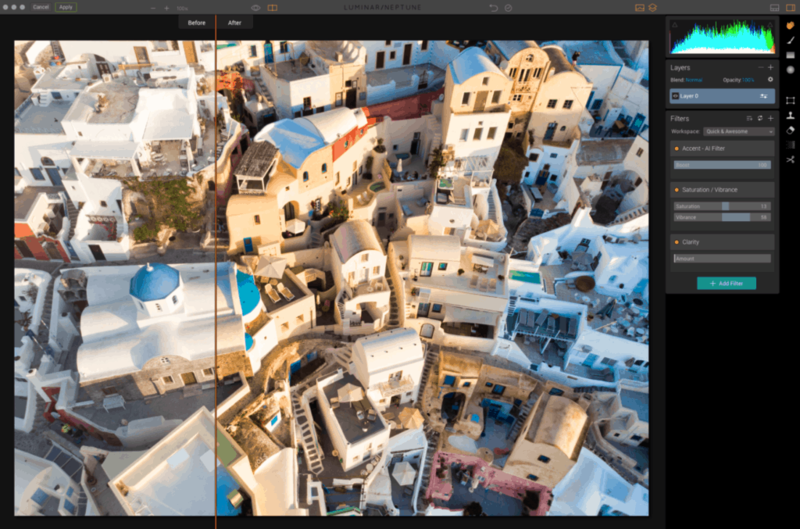 Luminar is for every photographer, from beginners to pros. It works on Mac and PC. That is correct everyone can use this awesome software. Can I use it with Lightroom? The answer is yes you can. Luminar can be used inside of Lightroom as a plugin. 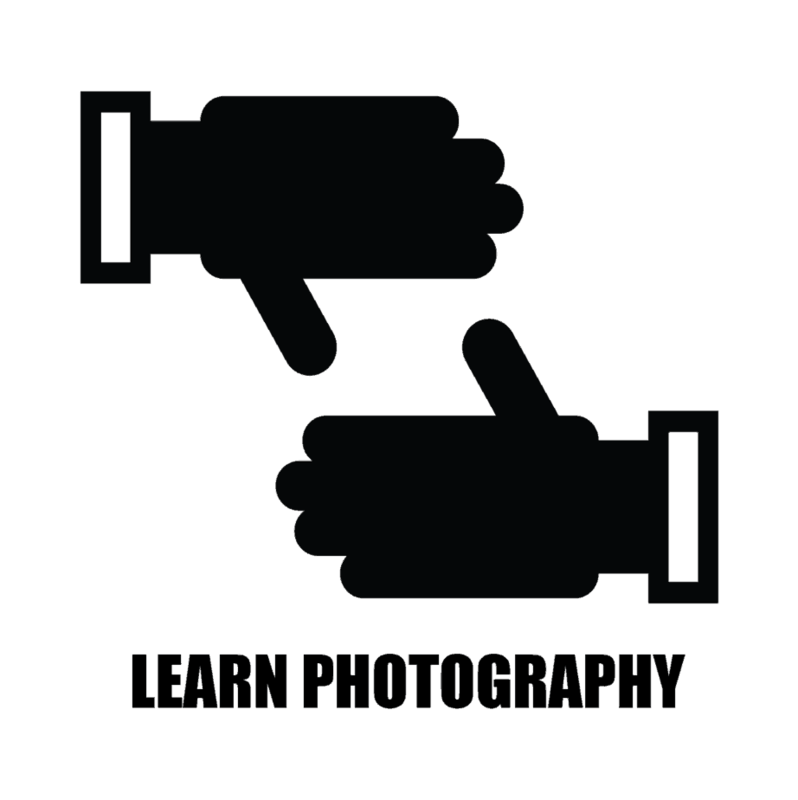 It is very easy to install and it has so many more adjustments than Lightroom. If you find yourself to be overwhelmed with all this filters and masks and adjustments. 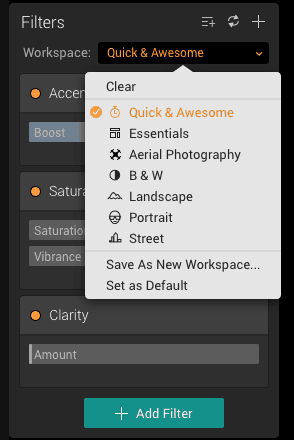 Do not panic, Luminar has an awesome workspace called quick and awesome. It basically does the work for you. I know it is crazy to think about software reading your mind, but it really does. When you pick the quick and awesome workspace there is a slider to boost the image as much as you want. Then magic happens. These are all the workspace options you have. 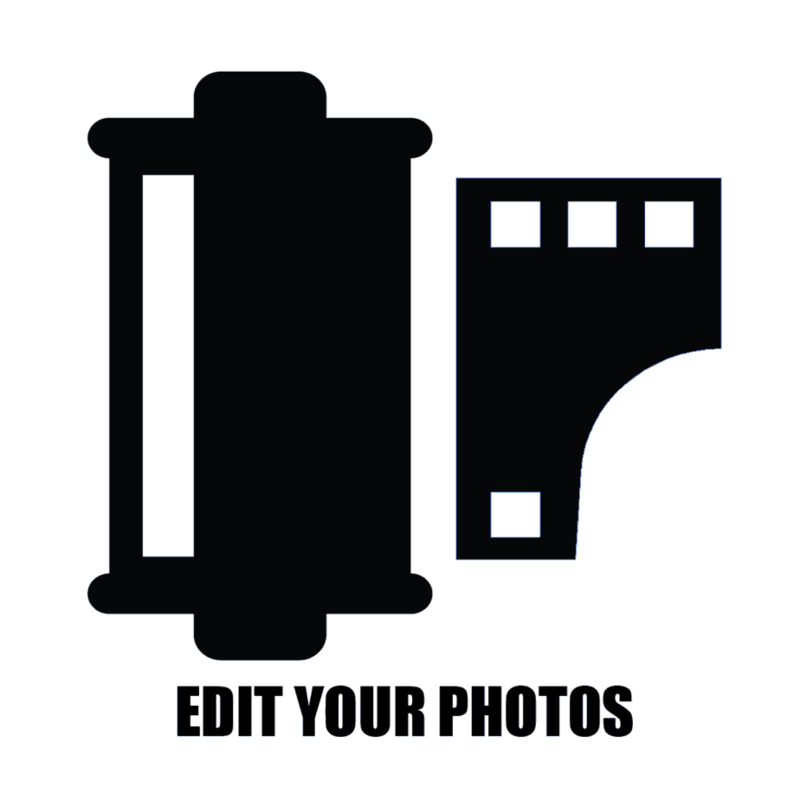 You can also create your own making your workflow even better. 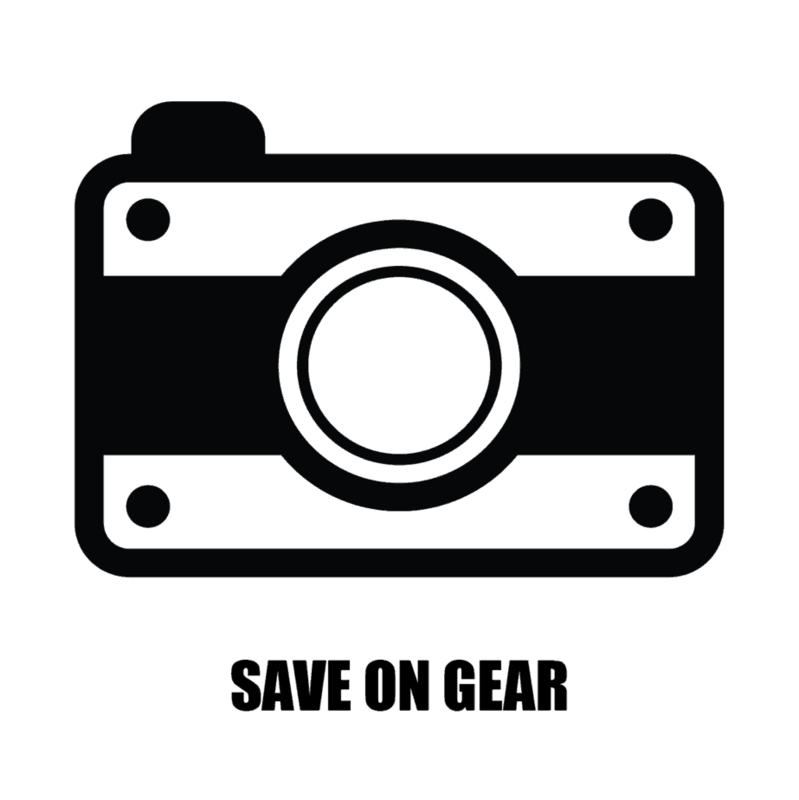 Are you into drone photography? 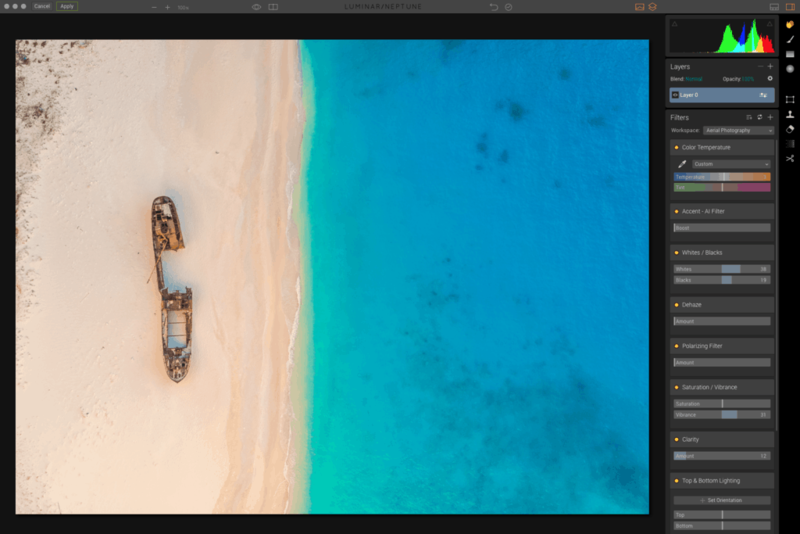 Skylum Luminar is loaded with Arial photography workspace as well as presets so you do not feel lonely inside the software. It works really good. 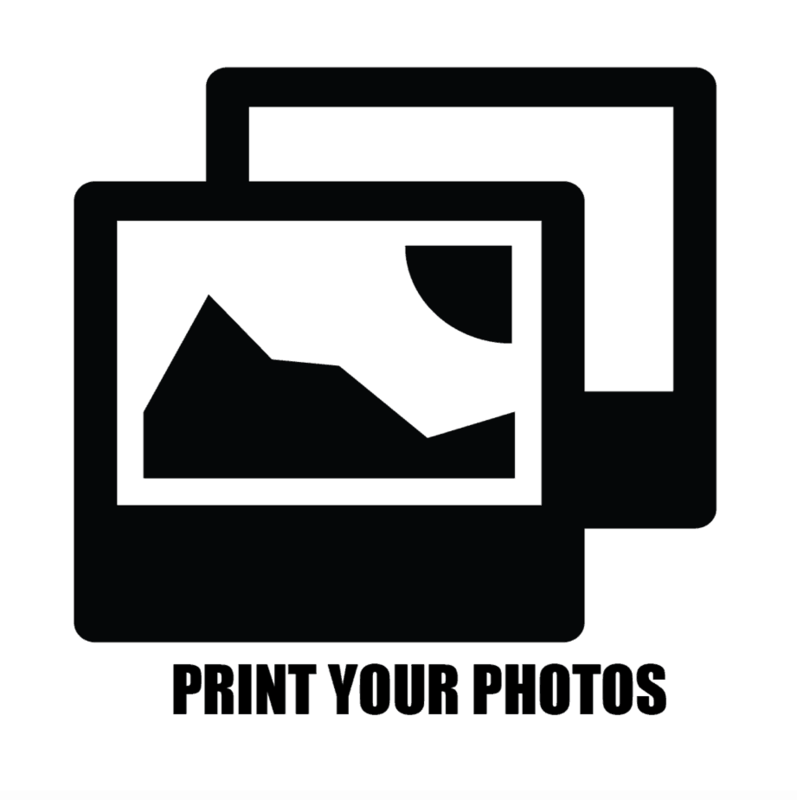 Check out the portrait workspace. It has so many options to beautify your portraits. Once you open this software up, you will be addicted. (just doing this review I have edited 15 photos and I keep forgetting I am doing a review) lol not a bad problem to have. Bottom line is that Luminar is a great piece of software. It is another tool to have in your toolkit. 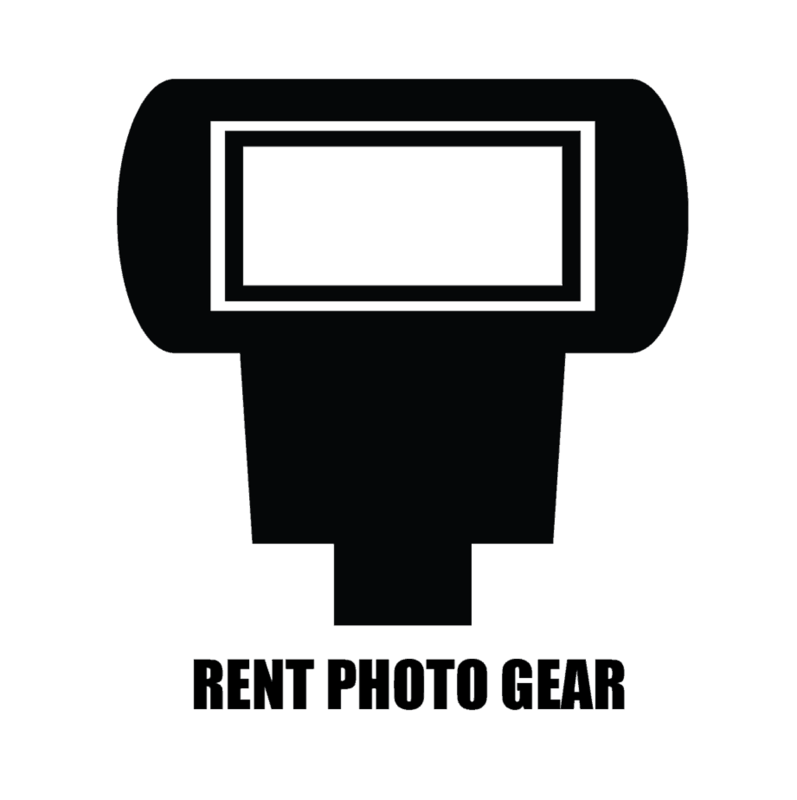 Luminar has many different workspaces form street photography, to landscape photography, to portrait photography and the list goes on. 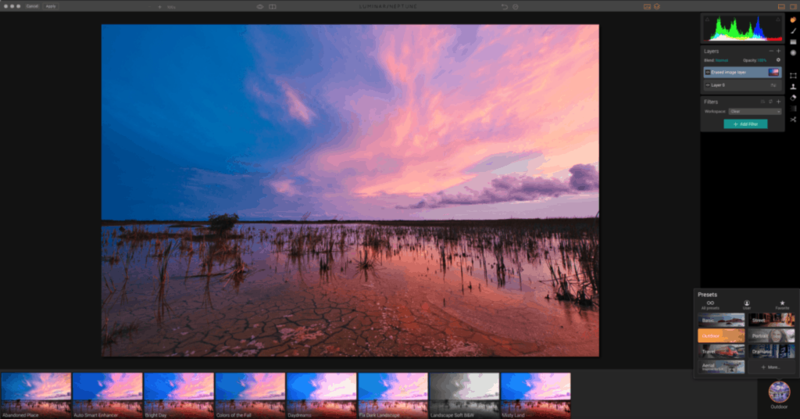 Skylum Luminar truly is designed by photographers for photographers. 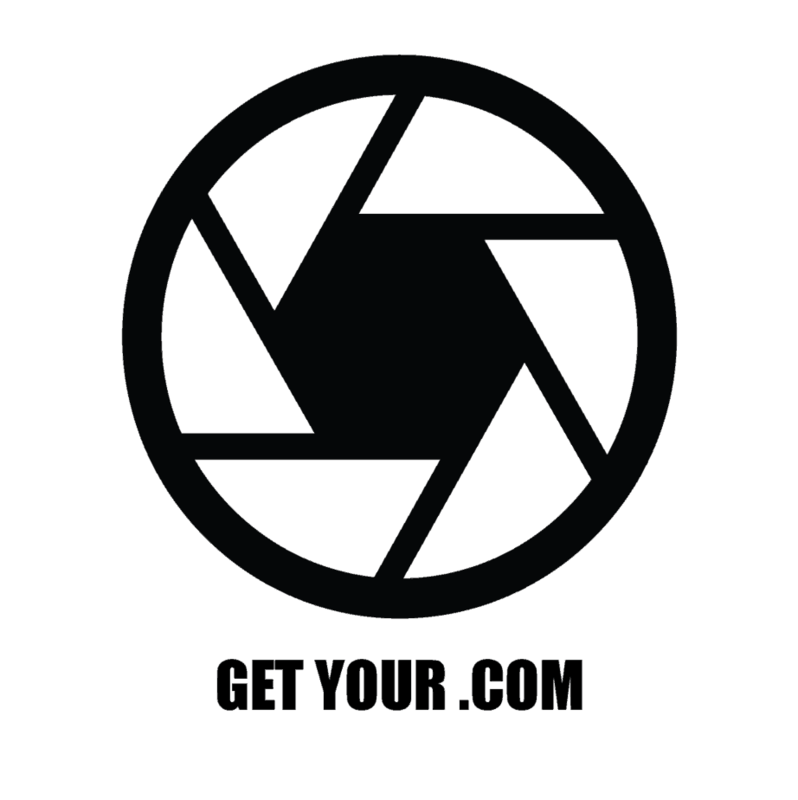 Try it out for FREE. You can grave your copy here. Use code FINEART at check out to get a discount when you follow this link.